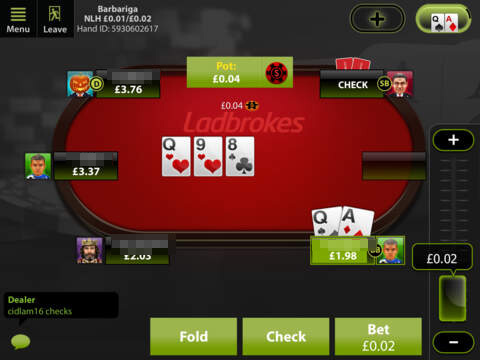 The british bookmaker Ladbrokes launched a new real money Poker App in September 2014. Ladbrokes mobile poker is available for Android and – in the UK and Ireland – iOS. We reviewed the app and give you all the information you need to know, like: Is it available in my country? Where can I download it? How does it work? And how about a promotion code or bonus offer? Read our detailed Ladbrokes Poker App review and find out this and more. Register for a new account here if you haven’t got one yet. Please insert POKERAPP1 when asked for a promotion code. Once you are registered, follow this link to Ladbrokes mobile poker FAQ where you can find the most recent download link for the Ladbrokes apk. iOS-users can download the App from iTunes. Fans of Ladbrokes Poker had to wait for a long time to be able to play mobile poker again. There was an Android App once. But since Ladbrokes left the Microgaming Network, it no longer worked. In autumn 2014 the new Ladbrokes App for the iPoker network finally arrived. Not only for Android but also for iPad and iPhone. Let’s take a look at the App. As already mentioned, it’s a native App for Android and iOS. It runs quite smooth on all devices we tested it on and looks pretty nice, too. In our Ladbrokes Poker App review we were able to confirm that you can play all available real money Cashgames on the mobile client. Mobile poker uses the same player pool as the desktop software. This said, it’s no surprise that there were lots of tables to play at during our Ladbrokes Poker App review. In addition to the cash games there is a Texas Holdem fast fold-variant in the App, too. Speed Poker allows you to directly get new cards once you have folded your hand. 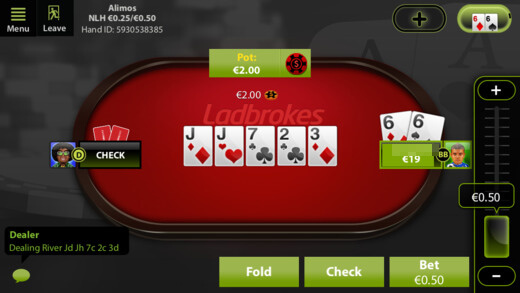 On top of that, the Ladbrokes Mobile Poker App allows you to play at multiple tables at the same time. A feature that is still pretty rare for a Mobile Poker client. If you are new to Ladbrokes, you shouldn’t miss Ladbrokes’ extremely nice welcome offer. Ladbrokes offers one of the best promotions on the poker market by welcoming you with a 200% Bonus of up to £1200 or €1500. Highrollers will maximize their profit thanks to the huge bonus. And less experienced players still profit from the 200%-bonus. You only need to deposit £50 to receive £100 on top. The bonus is cleared in small steps of $5, which is really fair. Completely new to real money poker is the new Paypal quick registration. If you have a Paypal-Account, you can register at Ladbrokes very comfortably and make your deposit.